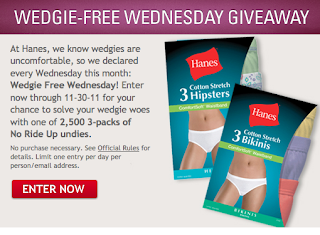 'Like' Hanes of Facebook to enter their Wedgie Free Wednesday giveaway :) They are giving away 2,500 packs of 3 pairs of No Ride Up Undies. Winners will be chosen at random. Good Luck!